The name lobster mushroom is a bit misleading, because lobster mushrooms aren’t mushrooms at all. Anymore, at least. The lobster mushroom, also known as Hypomyces lactifluorum, is a parasitic fungus that grows on select species of mushroom, creating an organism that completely differs in smell, taste, and appearance. Once a mushroom has been attacked by the fungus, it takes on a bumpy, bright orange outer skin and white interior. It also contorts into new, mushroomy shapes. The fungus is an effective parasite, as it makes its host produce Hypomyces lactifluorum spores rather than its own. But that’s a gift for a gourmand, because lobster mushrooms aren’t easy to find. The picky parasitic fungus consumes only Lactarius and Russulas mushrooms, which are often found in old-growth forests in North America, specifically the Pacific Northwest, and they need to be foraged. The fungus is named not only for its orange-red color, but for its seafood-like smell. Lobster mushrooms, therefore, pair well in seafood dishes, as well as in pasta, egg dishes, and soups. Chefs generally recommend cooking lobster mushrooms simply, though, either by pan frying or sautéing, to preserve their subtle seafood flavor. The orange color will leech out, creating a bright juice. Compared to normal mushrooms, lobster mushrooms have more crunch. Between their unusual texture and lobster coloring, they remind you with each bite that you’re eating the result of a curious evolutionary battle. 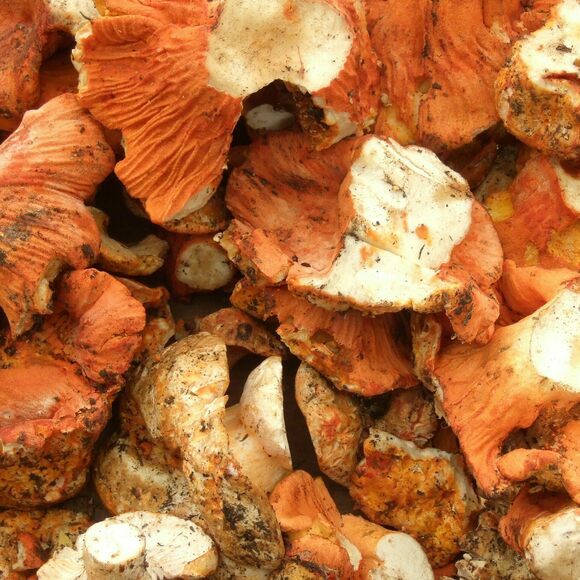 Fresh and dried lobster mushrooms can be ordered online through specialty fungi distributors. They are easiest to find in person in or near the areas where they grow, especially the Pacific Northwest. Try specialty fungi purveyors like Far West Fungi in San Francisco and Foraged and Found Edibles. They are in season in September and October. This eatery with an ever-changing, locally-focused menu features lobster mushrooms when in season. This pretty mushroom smells like rotting flesh. This coffee additive and killer of trees has a reputation as a medical marvel.